Earlier this year we caught up with London Stencil artist The Dotmasters while we were in Marrakesh, Morocco for this year Marrakesh Biennale. The artist was one of eleven international and local street artists invited to paint murals in the city as part on MB6:Street Art (Previously on Hookedblog), one of the Biennale's parallel projects. 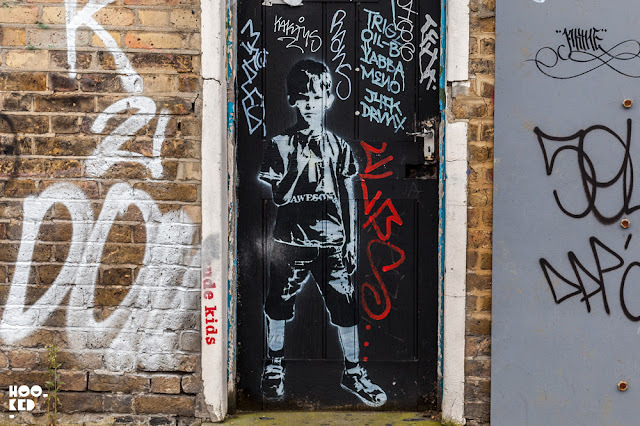 Prior to our visit we had been seeing The Dotmasters series of Rude Kids on the streets of London, life sized stencils of kids and teenagers all posing with various obscene hand gestures. Some of the works were quickly removed by the cities cleaning teams but a number are still visible including the one pictured above located in Hackney Wick. This week The Dotmasters' Rude Kids are heading West to Portobello Road and moving indoors for the artists new show also titled 'RUDE KIDS' at the Graffik Gallery. The show will see the artist present new works along with some of his classic Rude Kid pieces. The exhibition will also see the launch of a new collaborative ‘street art’ wear collection with fashion brand Pills and $ Bills which will see the release a small selection of garments including hoodies, pants and tees that will be on show at the gallery for four days from the 14th July 2016. The Dotmasters new collection of work will be on show at the gallery space until the 26th July. To tie in with the opening of the Rude Kids exhibition, The Dotmasters has also painted a three story mural on the outside wall of Graffik Gallery, check out the video below of the artist at work on this new mural. Dates: 15th July — 26th July 2016.